Yesterday I spent a rather large chunk of time making homemade salsa. Salsa doesn’t really take long to make unless you have two cute little tarzan’s vying for your attention (read driving you insane). We love salsa in our house and could eat it everyday. My husband can not eat seeds and store bought salsa’s always contain seeds. The only way we have found to get around the seed problem is to make it ourselves. Salsa can be made so many different ways. I’m just providing a template based on general ingredients but you can change it up to suit your taste buds. Additionally, I made a lot of salsa, about 50 ozs (two pasta sauce jars) so my measurements may not work for you but this salsa does freeze well. Since I made a big batch I processed each ingredient by it’s self. If you are making a small batch you can just throw it all in your food processor or blender and blend one time. Cut tops off of tomatoes and remove seeds if desired. Process until tomatoes reach desired consistency. Cut and peel onions and put in food processor until desired consistency is met. Cut stems off of peppers. Remove seeds if applicable be careful because hot pepper can burn your skin. (I recommend wearing latex or rubber gloves for this step. I sometimes even us a plastic sandwich bag on one hand. I know I’m awesome!) Process peppers until very small. Removing the seed will make your salsa very mild. Peel garlic, add cilantro and lime juice then process. Combine all ingredients together and add salt. Time for a taste test, add any other ingredients or spices. I added 1 tbsp of chili powder for a little extra kick. 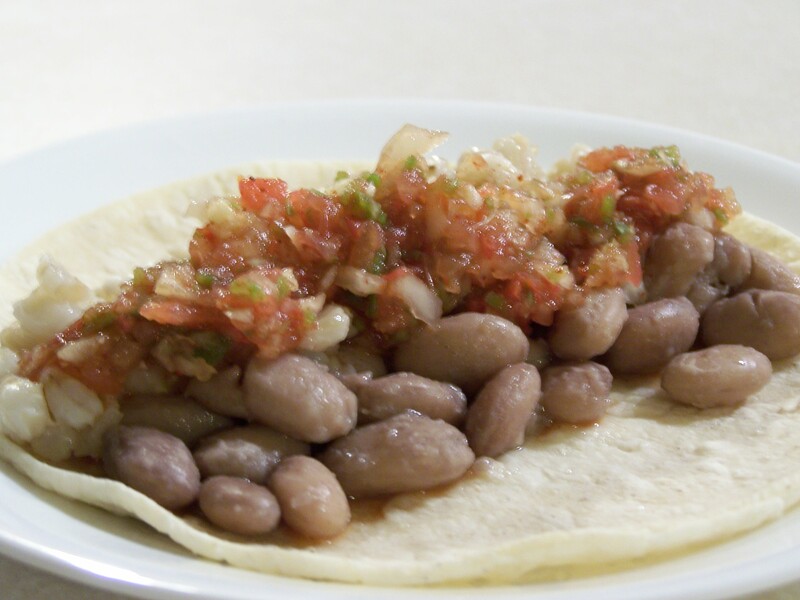 For me, salsa opens up so many meal possibilities. We ate this salsa on pinto and barley tacos. I really wanted to make a rice and black bean bowl too, maybe later. This will be really good on top of leftover baked potatoes for a quick lunch. 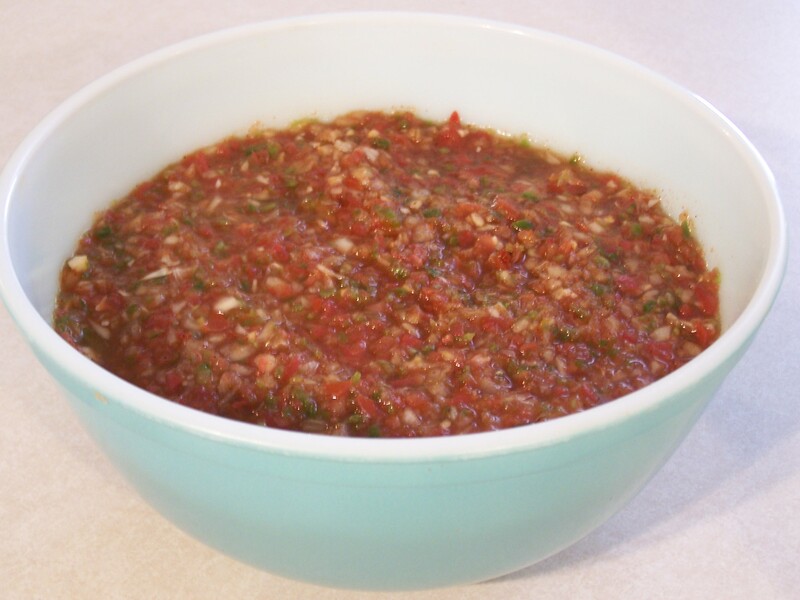 What is your favorite way to make salsa? What is your must have ingredient? Homemade (as usual) salsa is SO much better. Jarred stuff has that…funky taste. My partner could eat salsa on everything, I think! I’m confused on the amount of onion. Did you use 1/2 of an onion or 1-2 onions? Thanks! Sorry for the confusion, I use about 1/2 of one large onion. It can also vary depending on how strong the onion is. Some onions are mild so I add extra and others are strong so I add less.